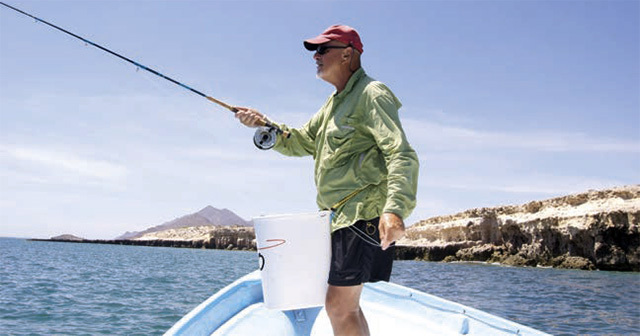 This larger container I’m using was especially useful fishing from a panga in Baja because I could remove it from my waist, place it between my legs, and drop line into it similar to what you can do with a stripping bucket. Fishing off Rhode Island some years back, I lost a rare opportunity with a bluefin tuna because I was inadvertently standing on a section of line when the fish took my fly. I was striper fishing with my friend and accomplished Connecticut fly fisher Larry Merly. I spotted tuna breaking the surface a few hundred yards from where we were drifting, and Larry immediately headed out to intercept the school. 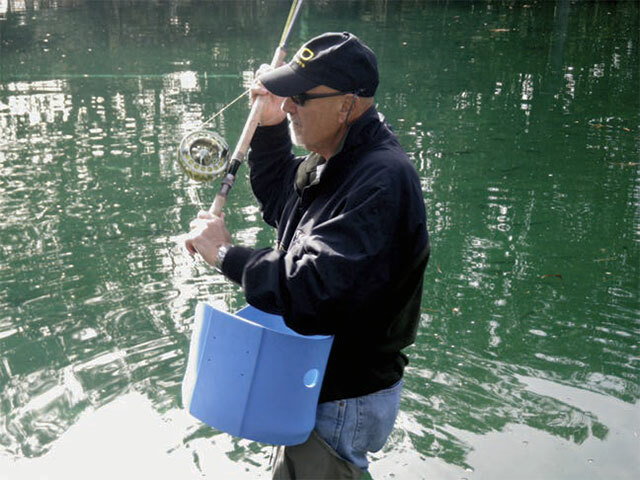 I was wearing a basket but took it off when I switched to a heavier 12-weight outfit for the bluefin. Because I was in a hurry to make a cast as soon as we slid in front of the fish, I didn’t want to take the time to put it back on (we’re talking seconds). This proved to be a very costly decision. I made the cast and started stripping line furiously when one of the brutes nailed the streamer. The line shot up from the deck with alarming speed, and then suddenly everything went slack. A small section of line was caught under my left foot and the tippet broke. Needless to say, this was a very sickening experience made all the worse because it could have easily been prevented had I taken the time to use the basket I was wearing only minutes before. 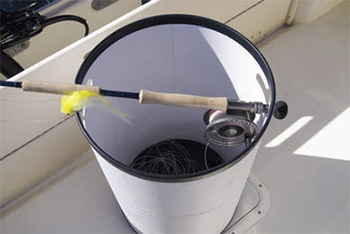 A stripping bucket like this would have given me a much better chance with that bluefin tuna. It keeps everything primed and ready to go even when the boat is underway. On flats-type skiffs with level decks, one solution for those who don’t want to wear a stripping basket or use a bucket is a product from Carbon Marine called the LineLair. This is a 22-by-22-inch soft rubber stripping mat with flexible rubber projections that does an excellent job of containing line as it falls toward your feet. The first time I used one was in Naples, Florida, on Captain Roan Zumfelde’s skiff. We were in the backcountry, the wind started to crank, and line was being blown off the deck. Roan dragged out the mat and there were no further problems. A container can provide an added service by protecting your line from harmful agents like gasoline or bug spray. During a Mexico trip years ago, we were fishing from a skiff (panga) and my partner was doing fine without a basket, simply letting his line fall on deck. After an hour or so of fishing, he began to notice that the fly line coating was starting to peel off. The boat deck was clutter-free, and we couldn’t determine what was causing his line to deteriorate. However, we soon began to smell the cause of his problem. Gasoline leaked on deck from one of the hoses, and it destroyed a line that was practically brand-new. The more line you have out, the greater the probability that Murphy’s Law will rear its ugly head. In this respect the increasing popularity of shooting heads and two-handed rods can exacerbate line management problems. The extended casts associated with these systems involves long sections of running line that have to be properly contained to minimize the occurrence of distance-robbing tangles. There are containers on the market that are made specifically for fly fishers, or you can fashion your own. Two commercially available baskets I have experience with are Sea Level’s Belly Bucket and the Linekurv stripping basket. A deep stripping basket is very useful when shooting long lengths of line with two-handed rods. 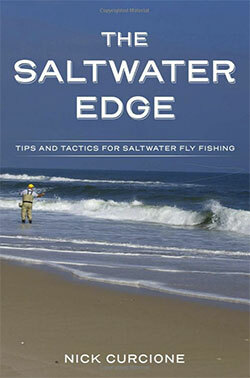 This one is available from Sea Level Fly Fishing. Unlike many of the baskets I’ve purchased over the years, neither of these is too small or too shallow. You don’t want one where the line easily falls out with the slightest motion. The Belly Bucket is made of neoprene, and the Linekurv basket is plastic. These materials are better than mesh-type baskets. The latter may fold for easy storage, but their sides tend to collapse. Despite all their features and partly because I’ve been doing so long before stripping containers were commercially available, there are times when I prefer using baskets that I’ve made myself. I’ve used everything from dishpans to milk cartons. The fact that there is such a vast array of plastic and rubber containers designed for all sorts of uses is fortunate because you’re bound to find something that can be easily adapted as a stripping basket to suit your particular needs. I haven’t found one yet that is ideal for all the conditions you are likely to encounter, but they are so inexpensive to make (the total cost for all the materials shouldn’t be more than $10), you can easily have several at your disposal. If I had to limit myself to just one, it would be the ubiquitous plastic dishpan. I first started using one in the early ’70s for wade fishing Long Island Sound. As is the case with many handmade items, over time I made a number of improvements. Using a basket with its standard perfectly smooth bottom is better than having no container at all, but the line will still tangle readily, especially when you make any movement. I liken it to linguine in a pasta bowl. The way to alleviate this is to insert a number of flexible spikes up through the bottom of the container.